As a leader and specialist in Student Life Centers since the mid-90's, MHTN asks from a student's perspective what they want on campus and how they can call it a place of their own. The new George S Eccles Student Life Center and Ray and Tye Noorda School of Dentistry take student life to a whole new level of design and healthier living for its students at the University of Utah. "The architects really listened to our students and incorporated things that I would not have thought of, but were important to our students...It's been an amazing addition to our campus. I honestly believe we are helping our student population be more healthy," said Barbara Snyder, VP of Student Affairs about the collaborative design process with MHTN Architects. Read more about the publication from Utah Design and Construction below. See more pictures of the new Student Life and Dental School on our Instagram page. 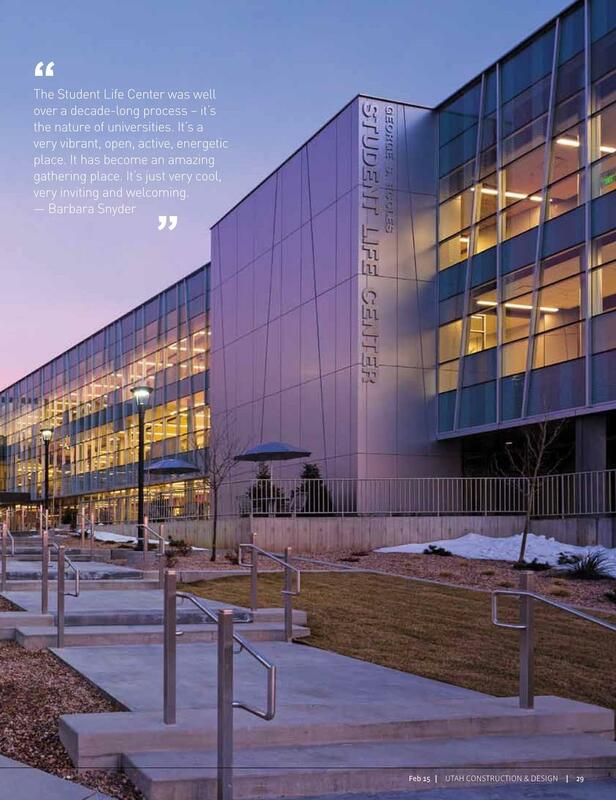 New Life was originally published in Utah Construction and Design's February 2015 Issue.